Bring a large pot of water to boil over high heat. Clean cabbage by removing outer leaves and discarding them. Carefully peel off whole cabbage leaves. Place in boiling water. Boil cabbage until tender (about 10 minutes). Drain, and place in a bowl of ice water to cool. Drain again, remove the 8 largest leaves, and place them on a work surface. Place salmon pieces on top of cabbage leaves. Season with salt and pepper. Roll sides of cabbage in, and roll up the salmon. Grease an ovenproof baking dish with olive oil. Add Vegetable Stock to the base of the dish. Place rolls seam side down in dish. Cut up remaining cabbage into bite-size pieces. 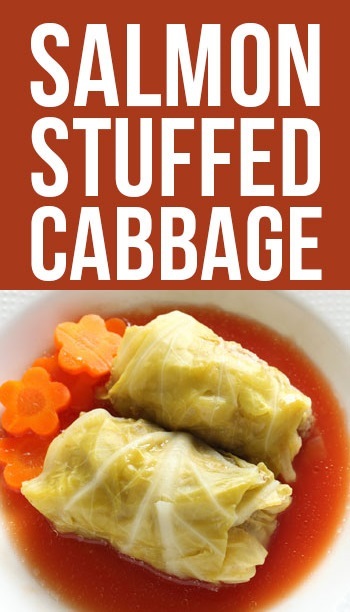 Serve salmon rolls on top of the excess cabbage while still hot.